You may have noticed quite a few module updates available (for those of you running 2.5, which we hope is most of you). Although it seems like a lot there is really not much to it. There were a handful of minor bug fixes in half a dozen of the modules that have been sitting in the repository unpublished. the language pack module. We just thought with the New Year, we would get all the modules in sync as it makes it easier for us to manage and make sure when real bug fixes are checked in, we get them published and out quickly. Did You Notice the Hats? For those of you who visit the front page regularly, you may have noticed that sledge has been having a little fun over the last month or so. Our favorite mascot (who sledge has named tango, yet the jury is still out if you would like to make suggestions) normally looks like this. But as different events and seasons have come up, you may have noticed that he is gaining quite a collection of hats. the front page. I’m going to figure out a place that is optionally visible on most of the pages on this site so that you can join us in our fun without having to remember to check on the front page. 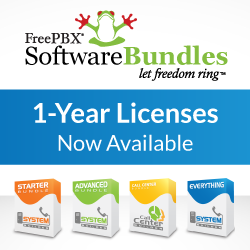 Are you looking to expand or deepen your FreePBX knowledge? The next Open Telephony Training Seminar is scheduled for March 3-6 at Digium Headquarters in Huntsville, AL. We hope to see some more of you there as it is a great place to learn and network with you colleagues. Help us maintain the reputation of being the funnest group for a training seminar that Digium had seen since moving into to their new facility! As a New Year celebration, be one of the first to register this year using the NEWYEAR discount code and receive a discount of $500! For now, we hope that all of you had a great Holiday season and are excited about all we can do in this coming year! Philippe – on behalf of FreePBX team!